When Facebook kicked off 2018 by announcing plans to make posts from Pages – including charities, businesses and publishers – less prominent in people’s news feeds, we got worried. 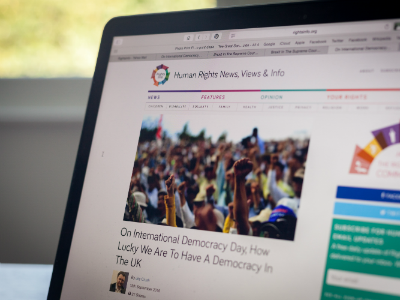 RightsInfo is an innovative human rights charity that produces accessible and engaging digital content to help people understand their rights in the UK. We publish daily human rights news, as well as videos, animations, quizzes and infographics – all disseminated on social media. So this news was a big deal. We feared Facebook users would be seeing a lot less public content like ours pop up organically in their feeds, but instead it’s actually had the opposite effect. Here are some of the things we’ve learned. So, how does a human rights charity that is dependent on social media interactions to deliver our message make sure people are talking about our stuff? Some commentators predicted only controversial posts would break through, as these would be the ones generating the most heated conversations. It was tempting to start writing provocative posts about the most inflammatory human rights stories… but that’s not really our style. For some time, we had been working on how we used images and headlines in our social posts to drive people towards interactions – essentially, goodbye clickbait, hello comment bait. We also already had an advantage over other organisations fighting for the same news feed space: we don’t sell a story in quite the same way. Yes, we publish relevant, timely content like a media outlet – but we also seek to communicate on a values level, using positive framing and storytelling. We try to engage our audience by showing them they already do care about the subject, not by trying to convince them that they should. Understanding the general profile of your audience, and how to drive responses, is key. We’ve moved towards asking questions people will have a resounding answer to (‘Yes!’ ‘No!’), or that draw on their values and emotions (‘What would you have done/how would you feel?’) or that indicate our content is topical and gives insight into current events (‘Why is Theresa May doing X?’). Here’s just one example. One of our recent videos on child homelessness performed comparatively badly on first posting. It was massively improved on the next day – which is significant as Facebook usually penalises reposting in short order – when the post was changed from the rather abstract and blameless ‘Homelessness has a massive impact on children’ to ‘As part of Theresa May’s reshuffle, she’s appointed a new Housing Minister. Here’s why he’ll have to think about tackling homelessness in 2018 ’. We know giving people something to engage with and debate is key, and the challenge for us is to do it in a way that is politically balanced and not seen as clickbait. This is a great example of us doing that well. If the video had this copy on first posting, it would have performed dramatically better overall – but at RightsInfo we love to learn from our mistakes! Encouraging people to comment on our posts has long been a way to build our community. Human rights is always going to be controversial for some, and we’re proud we can instigate a conversation on Facebook and then watch as our dedicated followers debate with anti-human rights commenters, with moderators only very rarely needing to step in. To some degree, we see increased comments and reactions as a way for us to break out of the echo chamber. Since the turn of the year, our impressions are up 35% and engagements are up 84%. The picture looks good across the board – our organic impressions have held steady, and we have seen an uplift in website traffic – but a lot of this increase is due to viral success. Comparing two very similar flagship videos – one published before the algorithm change and one after – we saw the second video very quickly gain traction on Facebook, and on day one, it achieved quadruple the release-day reach of the previous video. Sure, each piece of content is different, but what we’re noticing is that great content on Facebook can now truly soar. On click-throughs, we’re finding that it’s perhaps slightly more volatile now, but when we get the message right, our click-through rate is really boosted. We’re seeing further value from ‘meaningful’ interactions as our bounce rate from Facebook referrals has decreased slightly. Plus, on pages per session we’re noticing more readers from Facebook, reading slightly more pages, spending slightly more time on the site. As Mark Zuckerberg said, “By making these changes, I expect the time people spend on Facebook and some measures of engagement will go down… but I also expect the time you do spend on Facebook will be more valuable.” At RightsInfo, we really do hope time spent watching our videos and reading our content is valuable. We strive to be refreshing and insightful, so that we continue to grow as a trusted source of news on all things human rights. Julia is an award-winning broadcast journalist and digital media specialist. She has worked at ITV News and Sky News, held senior roles at Channel 4 News, and was part of the editorial team for Channel 4’s BAFTA-winning coverage of the 2012 London Paralympics. She has won awards for her documentaries about domestic violence, Ebola and asylum seekers. With experience on both the editorial and management sides of media businesses, she also has a track record of using storytelling and digital media to create social change. Julia received a BA in English from Magdalene College, Cambridge and a Postgraduate Diploma in Journalism from City University.